A new image said to be of a redesigned Apple USB power adapter has been shared by a user on Weibo (Google Translate, via Gizmobic), hinting that Apple's supposed new Lightning cable may be released alongside a new charger. The power adapter appears to be more rounded compared to Apple's current offering, and also includes grooves on each side to improve comfort while holding and inserting the accessory. While it is possible that the product in the image could be of a fake, the charger does have the signature "Designed by Apple in California" text along with other applicable information and logos. The user also shows another image of the new Lightning cable with its reversible USB connector, which has been spotted in a number of other photos and even a video throughout the past few weeks. If both new products turn out to be real, it is possible that Apple could ship a new Lightning cable and new USB power adapter alongside this fall's expected lineup of new iOS devices, possibly starting with the iPhone 6 next month. Update: As pointed out by a user in our forums, the USB adapter shown in the images carries the same design as Apple's current 5W USB Power Adapter sold in Australia. 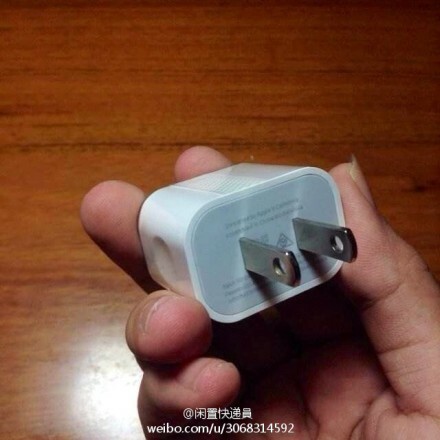 However, the prongs on the new adapter in the photo are of Type A used in the United States and many other countries, perhaps indicating that the design could be soon applied to Apple's other power adapters in different countries. Current Australian chargers look like this! and also includes grooves on each side to improve comfort while holding and inserting the accessory. Wow, Eddy Cue was right. This IS the most exciting pipeline I've ever seen. I wonder if samsung will rip this off as well. It's wider... they should have 2 USB ports. And why do leaked pictures require uncut fingernails all the time? It's to disguise their identity. Afterward, they clip their nails so they can deny it was them, like shaving off your beard after robbing a bank.